Wow, what a cool little tube. I came across it by accident when I received the latest lot of tubes and 300 of them were these little things. At first I didn’t quite know what to do with it, but what the heck it’s a dual triode with gain similar to 12au7, so the experimentation started. Imagine my surprise when the tube not only performed well, but it sounded amazing!!! The tube has a magical balance between transparency, warmth and musicality. The music and vocals were superbly liquid – to the level where I had to rip out my favorite tube out of my amp and start using this little MONSTER. Transparency was second to none and no sharpness in the sound – just a musical bliss. Darn! The tubes come in black (up to 1985) and gray plates (after 85) – I was unable to hear much difference – gray plates maybe was a bit more musical. 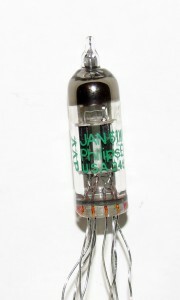 Well, there is an issue with the tube – it has flexible leads, you can’t really roll it – without an appropriate adapter – which to my knowledge are not produced by anybody, since the tube is supposed to be soldered in, but if you are into DIY and can put the pins into socket saver for 12au7 or 6sn7 (very, very carefully – remember VERY high voltages), you might find yourself unable to stop listening to music.